North Carolina is a state with unparalleled natural beauty. There are majestic mountains to behold and hidden waterfalls to discover, yet many North Carolinians don’t get to experience the natural wonders that the Old North State has to offer. Coming across lions, tigers and bears. Oh, my! 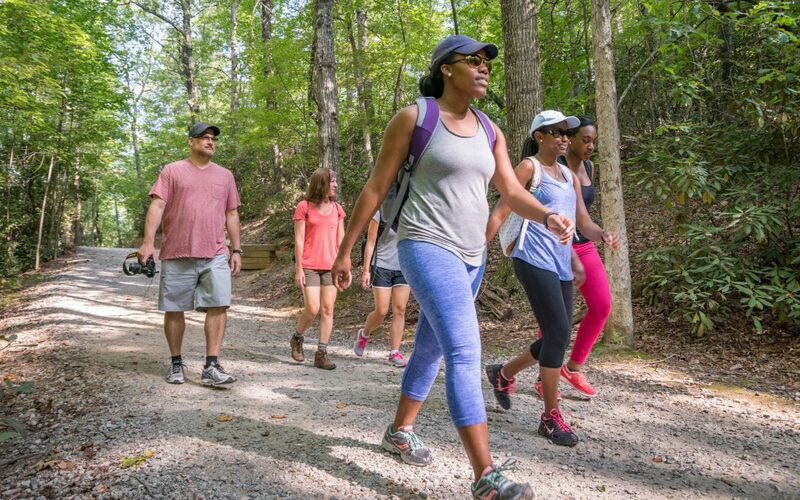 This fall, Blue Cross and Blue Shield of North Carolina (BCBSNC) is taking all of the hesitation out of hiking. Our new Hike NC! initiative aims to make hiking an easier, more approachable experience for North Carolinians across the state. With cool air gearing up to chase the summer heat away and autumn colors preparing to make their grand entrance, there is no better time to get out and Hike NC! Get Moving With Hike NC! Hike NC! will offer more than 60 free, guided hikes in North Carolina’s parks, nature preserves and outdoor spaces. The hikes will be led by some of the state’s top hiking experts (which means you won’t get lost!). No matter your age, fitness level or hiking experience, these guided hikes will provide you with a fun and easy opportunity to get out and watch Mother Nature show off her beauty. Now, without any of the old barriers that may have prevented you from hiking in the past, the only thing to stop you in your tracks is the beautiful autumn foliage. All you need are comfortable shoes and a bottle of water. The hikes will begin this weekend and will take place statewide through the end of the year. I hope you will join BCBSNC and our partners for a hike this fall. Hike NC! is a collaboration with leading hiking experts across the state, including North Carolina State Parks, the North Carolina Recreation & Park Association, Friends of State Parks, Great Outdoor Provision Co., and Joe Miller, author, avid hiker and Chief Exploration Officer of GetGoingNC.com. Experts from these partnering groups will guide all of Hike NC!’s hikes. Hike NC! was created to make stepping into nature easy, so naturally, participating is easy too. Simply visit gohikenc.com to find a hike near you. Choose the hike that works best for you, and then register. That’s it! Once you’ve signed up, just arrive at the hike location to meet your hiking guide – and your new best friend, Mother Nature. Oh, and don’t forget to share your hike with us and other North Carolinians by using #HikeNC on Instagram and Facebook. Hike NC! is the next step in BCBSNC’s Get Outside North Carolina (GO NC!) community program, which was created in 2012 to encourage North Carolinians to get outside and get active. Whether you live near the mountains or the sea or in the middle of North Carolina, you can get outside and enjoy the beauty Mother Nature has to offer. James LaCorte is a Social Media Manager and has been employed by Blue Cross North Carolina since 2003. He has built his career working in a variety of areas across the company. When not working you can find him kayaking a local river, photographing a nature scene, or running around with his family.